TASC is grateful to have a large dedicated group of adult volunteer staff who see the great value of working with kids & teens. They care deeply about our young people and have a strong commitment to help provide good, clean, fun filled activities. Several have been staffing youth ski and snowboard trips for 10-20 years. We have a 1:10 staff to student ratio on our trips. The staff are on the trips to make sure the student has the best possible ski or snowboard experience. They perform a variety of responsibilities for the student skier or snowboarder on the trip such as; helping get fitted with the proper rental equipment, making sure they are in the proper ski school class, providing further instruction after the beginner completes the ski school class, providing instruction for all other levels and supervising on the slopes throughout the day. On the overnight trips, the staff supervise evening activities, take the students to their evening meal and make sure each student is in her or her room by curfew. 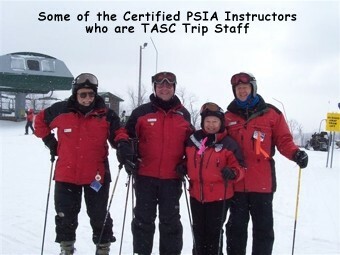 TASC for Teens is a traveling ski school and is proud to be a member school of P.S.I.A. (Professional Ski Instructors of America). Many of our staff are P.S.I.A. 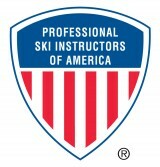 Certified Ski Instructors and participate in a variety of instructor clinics. Our P.S.I.A. staff offer ski pointers and tips at no extra cost.